Hi everyone, here's what I'm working on at the moment. It's nearly finished. 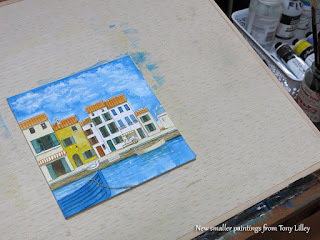 A naive style French harbour painted with acrylic inks on Bockingford HP watercolour paper which is bonded to mdf board. It's 7.5 X 7.5 inches square. I'm hoping this will soon be at Art Gallery online.